Eye - Pieces: 10z (WF) and 5x OR 15x (H). Electrical: For LED Input 180v-250v AC or for HL Input 220v-240v AC with removable imported cord. Condenser: Sub-stage abbe condenser NA 1.25 with aspheric lens and Iris diaphragm. Illumination: Halogen 6V-20W illumination with variable illumination control. 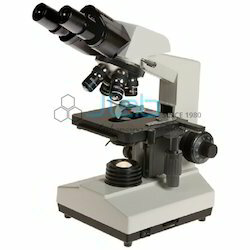 We are the known dealers of Labomed Microscope. Shambhavi Impex is offering Labomed Microscope also. Ideal for laboratory and reserach use, with coaxial motion and in built lamp. Extra Wide Field Eyepieces, Paried. - Power Consumption 8 & 16watts UV Tubes. With our efficiency and vast knowledge in this industry, we have come up with a commendable array of Trinocular Research Microscope. Observation Head: 45-degrees inclined Trinocular head rotatable through 360-degrees. - Achromatic objectives 4x, 10x, 40x. - Huygens : Eyepiece : H10x, H12.5x, H16x.